Doc’s Opinion is written and edited by Axel F. Sigurdsson MD, Ph.D., FACC. The website was initiated in 2012. Dr. Sigurdsson is also a licensed aeromedical examiner. 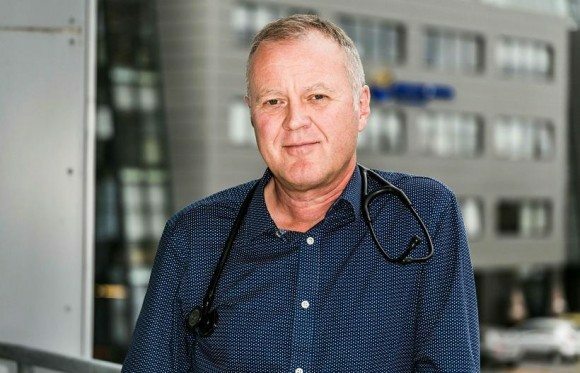 He has held the position of Medical Director of Icelandair since 2005. Dr. Sigurdsson main interest has been in the field of coronary heart disease and heart failure. He has published more than 100 scientific abstracts, articles and book chapters in international journals and textbooks. This blog is for general informational purposes only and does not constitute the practice of medicine, nursing or other professional health care services, including the giving of medical advice, and no doctor/patient relationship is formed. The use of information on this blog or materials linked from this blog is at the user’s own risk. The content of this blog is not intended to be a substitute for professional medical advice, diagnosis, or treatment. Users should not disregard, or delay in obtaining, medical advice for any medical condition they may have and should seek the assistance of their health care professionals for any such conditions. Dear Dr. Sigurdsson: I was directed to your statin link by a correspondent in StoppedOurStatins, a yahoo group I belong to. Thank you for the kind and accurate review of my book, The Truth About Statins: Risks and Alternatives to Cholesterol-Lowering Drugs. Indeed, I have no product line, or anything else to sell, except my expertise after more than 35 years as a cardiologist who has also been involved in clinical trials of cholesterol lowering drugs. I am very concerned about the long term risks of statins, particularly on the nervous system. I spent one memorable day in Iceland in September 2009 and have great admiration for your country. Having subscribed, I look forward to reading your blog on a regular basis. Dear Doctor Roberts. Thanks for your interest in my blog. I do think that you have written an important book. I deal with the question of statin therapy almost every day in my practice. These drugs have certainly given us the opportunity to affect the progression of cardiovascular disease and they have improved prognosis for many patients. However, the side-effects during long-term treatment have not been entirely clarified. Millions of people worldwide are taking statin drugs. Therefore it is so important for medical professionals and people in general to have knowledge about these drugs, both the positives and the negatives. I am a student at UC Berkeley working on a project that is exploring statin alternatives to reduce high cholesterol. I would love if I could have a couple of minutes of your time to talk about the high cholesterol problem and learn more about it. I am a physician practicing in the Boston area…. I recently read your comments regarding LDL-C and LDL-P..and their relation to CVD risk factors…You did a wonderful job of elucidating a very complex subject…I too believe that atherosclerosis is an inflammatory disease rather than a lipid disorder as are many of the degenerative disease so prevalent in the USA today. It is unlikely Americans will alter their diets any time soon…Som the next best plan is an antidote to AA. The best one currently available is EPA a component of fish oil..EPA acts to counter AA, by slowing the conversion of Omega-^s into AA and is a competitive inhibitor of AA on the COX and LOX cell membrane sites…EPA being orders of magnitude less inflammatory.. Large population studies have confirmed nations with lower AA/EPA dietary ratios are more heart healthy…The effect of EPA are dose dependent and the dose requirements in the USA are in the 4gm/day level..Much higher than are likely for DS fish oils.. There is a new drug currently FDA.approved for very high trigs…It is called Vascepa and was developed by an Irish company, Amarin…Their drug is highly purified EPA and it has wonderful clinical trials…If you are unfamiliar with it you should check it out…You might even wish to take it yourself..
Clare. Thanks for providing the reference. I hadn’t seen this paper by Dr. Grimes before. Really looking forward to read it. 1) His claim that CHD isn’t a multifactorial disease and that its cause is a “mystery”. Err, not exactly. He provides no evidence supporting this, apart from anecdotes (“I recently saw a man …”) and abundant use of a logical fallacy called “false dilemma”. The evidence pointing to a multitude of risk factors behind CHD is – to put it mildly – enormous. To deny this is practically the same as to make a religious statement in scientific discussion. 2) Another claim by Grimes – that well-known risk factor will (by some magical chance) not be risk factors in the developing world where CVD is already becoming a major problem. This is simply not the case, but Grimes downplays this by a selective reading of his own sources: see citation 68 (the Lancet editorial), which Grimes use to argue for his position by mentioning the apparent inconsistencies in risk factor data from the developing world. However, he fails to realize that the inconsistencies get explained when the confounding factors get accounted for. E.g. obesity rates increase in country X, but at the same time blood pressure & cholesterol don’t –> how come? Well, even in the developing world, medication is becoming more and more available – and the total risk is nearly always a sum of several issues on population level. This really smells the same ol’ BS as the “French paradox”, doesn’t it? Not to mention that Grimes’ prediction that CHD risk factors in generations born after the 1950s are somehow be different isn’t shown in observational nor clinical trial data. Nor is the claim that CHD prediction charts “outdated” being backed up evidence. Etc. etc. But yes, I do recommend that everyone read the paper. It’ll be a good exercise in critical reading – and a good reminder that just because a paper can get published doesn’t mean it’s worth that much. Mie. I disagree with you about this paper. Of course this is not a scientific study. It is an opinionated review. I found it very intersting. Dr. Grimes challenges many of the current beliefs of the medical community. But if nobody does that, there won’t be any progress. Dr. Grimes argues that coronary heart disease is an epidemic, likely caused by an unknown environmental biologic factor, possibly a microorganism. Of course I´m not able to say whether he is right or wrong. However, he makes an interesting case. I enjoyed the historical prespective. I don’t know whether Dr. Grimes is a “cholesterol denialist” as you call it, but he dertainly coes not suffer from “cholesterol fixation”. He believes for example that statins may work through other mechansisms than lowering cholesterol. Axel, a mere challenge means NOTHING. It’s the content & argumentation & new data that is the key. Grimes’ points are neither new nor convincing. This bacterial infection -thing as all the rage back in the 90s. You do know why it died away, don’t you? No evidence from trials testing antibiotics in the treatment of CVD and/or regression of atherosclerosis. Of course, bacterial infection can CONTRIBUTE to the progression. However, on the basis of evidence they don’t seem to be cause. Err, I don’t think anyone here (apart from Low-fat Richard) suffers from “cholesterol fixation”. I myself have often pointed out that I favor a more holistic approach addressing the multitude of risk factors. This is, however, besides the point I made: his arguments in this part (cholesterol & other risk factors) are clearly not valid but flawed. So flawed in fact that the term “opinionated” can indeed be used. Dr. Grimes conclusion could also imply that risk factors may not important anymore, because the epidemic is almost over. That could be a dangerous assumption, not least if it is based on pure speculation. Anyhow, I enjoyed reading the article. Reminded me about how little we know, and how much we don’t know. David, he doesn’t have a valid point. IF he had stated that CHD isn’t just about diet, then yes, the point would’ve been valid. But to state that diet has NOTHING whatsoever to do with CHD is simply false given the amount of evidence. Mie, My take on what he said is that the CHD epidemic has nothing to do with diet. I suggest you write to him for clarification. You are most welcome. It is very well written, easy for non scientific people like myself to follow too. It does not answer questions such as particle size ApoA – ApoB etc., but certainly gives much stimulus for thought. Professor Uffe Ravnskov has (for a long time) theorised that heart disease has a bacterial underpinning, and this paper would seem to perhaps hint at a similar model. Looking forward to your thoughts once you have had time to read it and comment. Is coconut oil(virgin cold pressed) good to take…a tablespoon a day for heart health or is it too much saturated fat? Is virgin cold pressed coconut oils safe to take by mouth…one tablespoon a day…for heart health? I am a 50 year old female, 5’5″ 144 pounds. Father had a heart attack at 60, Paternal grandfather died from heart attack at 63, Maternal grandfather from heart attack at 43. No history of heart disease in any females. January of last year my total cholesterol was 278. LDL 103, HDL 146, Triglycerides 54. My Apo B was 77, LDL-P was 1554. Lp(a) Mass 63. My doctor started me on a statin. Labs 9 months later show total cholesterol 252, LDL 56, HDL 171, Triglycerides 57, Apo B 51, LDL-P 793 and Lp(a) Mass 78. Unfortunately my liver enzymes went from normal to ALT/GPT 38, AST/GOT 77. I drink a fair amount of red wine but no other alcohol to speak of. I exercise every day (kickboxing, walking, yoga, tennis) and don’t smoke. I eat very few carbohydrates and almost no grain. I am considering stopping my statin because I have a greater fear of dementia and Alzheimer’s disease than heart disease, but I would love to know if you think that would be a good decision. Dear Dr Sigurdsson, I am female, 61 years old, and quite confused about whether or not to take statins. Two out of three cardiologists have strongly recommended them for me but I do not like the idea of taking them and have not taken any yet. My father had CVD and died at 82 (after back surgery). My mother is 83, quite healthy. She and I both have Mitral valve Prolapse. Mine is mild. Her bloodwork results and mine are very similar and always have been. My blood pressure is always on the low/low normal side, never elevated. I have oral lichen planus , osteopenia and am prediabetic (A1C last time – 5.8). I follow a quite strict low-carb, low fat diet (except for grass-fed cow butter, minimal amounts). I have never smoked, do high-intensity strength training a few times a week, am active. BMI 20.5. Would simply like to hear your opinion based on my numbers, etc. to help me decide what would be best. Appreciate this very, very much. Just wanted to thank you for taking the time to write the blogs. Truly interesting stuff to read. Thanks Andrew. Appreciate your kind words and interest. I am currently studying to become a dietitian. I love your objective, yet honest posts regarding many controversial/confusing nutrition topics. I have subscribed and look forward to reading you future posts. Thank you Ashley. Appreciate your interest. I’m glad you find the site useful, and thanks for taking the time to mention it. Wish you all the best with your studies. Hi Dr. Sigurdsson, This is a great piece. I would greatly appreciate if you included a mention of my book, which is the source of your arguments. The Big Fat Surprise: Why Butter, Meat, and Cheese Belong in a Healthy Diet (Simon & Schuster) 2014. My book was the first to make this case for rehabilitating saturated fats. I’m so glad to see that these ideas are getting out there, and would really appreciate your citing the source! thank you. I have responded to you by e-mail. I have been informally studying nutrition and fitness for the past five years or so and only today stumbled upon your blog while researching ways to lower LDL-P. You have a way of making difficult concepts easy to understand, and I look forward to reading more of your posts. Thanks for the comment and your interest in my blog. Nice to hear about our “oblique connections”. Sometimes I get the sensation that the world is smaller than we think. By the way, may son will finish his Master’s degree in law from the University of Iceland next spring. Hope you continue to visit Doc’s Opinion. I have really enjoyed reading your blogs. I have been getting an NMR profile for the past 3 years I am so confused by the results and what effects the numbers. I had read that increasing cardiovascular and weight training exercise will increase HDL but NOTHING seems to raise my HDL. I tried prescription Omega 3’s also. My HDL at it’s highest was 31 at age 38 and at it’s lowest at age 28 at (13).. YES!!! 13!!!!! Here is my latest NMR profile results. I currently weigh 150 lbs and I’m 5’9 and female. This is the most I’ve ever weighed and I normally weight 125-135. I do weight training and cardio 5 times per week and burn 500-680 calories in each 45 minute workout (it’s intense!). I have never smoked and drink probably twice per year. My weakness is sweet tea, but other than that I eat a balanced diet. I do not drink coffee or soda. Dad – had stint put in at 53 but heavy smoker and drinker and very overweight. So, what do you recommend. I went in for a cardiac scoring today but couldn’t do the test due to my heart rate increasing to 110 from 71 everytime I was put in machine. In general I feel great, I quit eating red meat and saturated animal fats a year ago, and eat olive oil, nuts, whole grains, shrimp, fish, chicken breast, fruits and vegetables…however, my numbers are not where they need to be. I am sort of just throwing my hands up in despair figuring the stress of worrying about my “mild atherosclerosis” will kill me faster then the disease itself.. I am in a quandary about how to proceed with my dietary intake at this point. It just seems to me that the key here is the low CRP level, since atherosclerosis feeds itself and builds plaque from stress and inflammation, correct? Several months ago I had some routine blood work done. At the time my total cholesterol was a whooping 314 even though I have been a vegetarian for over 35 years, exercised, and fasted two days a week. My triglycerides were very good and both the LDL and HDL needed improvement although not esp.bad. My doctor said he was not willing to prescribe a statin for me yet and with his okay I started to take red yeast rice. A few days ago I had blood work done again (at a different facility) and now my total cholesterol is 211…an unbelievable decline in over 100 points. Also the LDL and HDL are now at ideal stages but my triglycerides have gone up. Is it possible that the first facility made a mistake in my cholesterol level? Has anyone else experienced this great a positive decline after using red yeast rice for such a brief time? Thank you. This is not surprising. Red yeast rice is known to lower cholesterol. Hello. I agree with the doctor’s opinion that LDL-P might be a greater indicator for CVD. However, the question really is about what role cholesterol plays in the body and cholesterol is a supportive one. The higher number of LDL is just a symptom of your body repairing damage caused by other factors. Sending multiple ambulances to a bad accident scene doesn’t make the ambulances bad ambulances. The problem isn’t the ambulances. The problem, theoretically was the drunk driver. LDL, whether small particles or not treats systemic inflammatory conditions in the endothelium of the arteries The contents of the LDL that really cause the damage is not the cholesterol but the triglycerides that are contained within the protein package. Cholesterol is an inert substance. It has never killed anyone. Do you know about institutions/courses in the US or Europe, directed to physicians/dietitians who want to formally specialize in low-carb diets as treatment to diabetes ? I really appreciate your blog. This might be a weird question but I’am a young nurse from Scandinavia who for is highly interested in critical errorfinding in scientific papers especially in the field of medicin and nursing. If you were me what “path” or education choice would you go for. I really hope you can help me with this different kind of question. I live in the UK where doctors haven’t heard of the Try/HDL ratio. Whether both numbers are in m.mol/L (as in Europe), or, in mg/dL (as in US) it is a RATIO! A ratio of two (mass-per-unit-volume) density-units is surely the same (across measurement systems) as long as the two are consistent with each other within their own system??? Please can someone clarify, I speak to the doc. tomorrow. The molecular weight for TG and HDL-C is not the same. Therefore, the conversion factor for these two is not the same. Hence, the reference ratio for the TG/HDL-C ratio changes when you convert. I ask because, due to TC to HDL ratio of 4.6, my doc wants me to take a statin & I’m resisting a bit. Reading your assertions about Dr. Perlmutter, I’m wondering if you may have missed a crucial detail in his book. The book talks about how grains themselves have changed. In is own acknowledgement of the Mediterranean diet’s inclusion of grains, he talks about how not only wheat has changed but how the processing of it has changed. It has a ton more gluten in it than it used to, and my own research indicates that it’s processed more quickly and shipped when green. You may have a point here and this is certainly something we should take into consideration when talking about the health effecst of grains. However, although I’m generally in favor of carbohydrate restriction and eating more healthy fats, I still miss the scientific evidence for most of Perlmutter’s claims. Don’t misunderstand me, I’m absolutely not promoting grains, at least not for those who are insulin resistant. Is there any study that you know of that has compared the health effects of grains as the used to be and the “modern” typre of grains? Curious how they would get a hold of “paleo” grains to do the study. However, the studies that Pelmutter reference go back to the 60s and before. It’s not like they were published in Yoga Journal. They were published in the Journal of Neurology and other notable publications. Just hasn’t trickled down to the glyphosate-loving citizens yet. Whatever the issue, it’s without a doubt that all attention must be focused on inflammation. Pardon my post as I am quite new to this and maybe off subject bit. Could you help me understand the Coronary Calcium Scan, the test that ranges from 0 to 401 but can get scores upward to 1000. Is there a way you can help me understand how score interpretation relates back to actual CAD disease as this is an invasive test and not always a direct correlation to occluded artery percentage. My wife is a pillar of health, eats right, no fat, vegetarian and never smoked or drank etc. She has been on Crestor for years which appears to maintain appropriate CDL levels. The only negative is her family history notably her father who had 4 heart bypasses. She recently took the Calcium scan test and scored a 467. All arteries scores zero except the left circumvent which was 17 and her LAD which was a 450! If what the interpretation says is accurate, she has extensive plaque. Are there false positives from this scan if she does not have this extensive amount of plaque. However, selfishly, I would definitely appreciate any thoughts you might have. She always says she is fine but I have always been concerned about her exertion. Which she will deny. Any thoughts would be greatly appreciated. I’m Kevin Raneri from ArticleHub. We are running Health campaign for our client and I was wondering if you accept paid post opportunities. If yes, please let me know your rate per post and how long it will take you to complete an order. Also, to receive other blogging opportunities from our clients that are using our BlogDash’s system, I cordially invite you to create a blogger account here https://www.blogdash.com/bloggers. Dear Dr. Sigurdsson: I am a 60 year old female (5’7′ , 118 lb.) recently diagnosed with PVD and AFIB. I have had 5 angioplasties (3 on one leg and 2 on the other) in the last 6 mo. I do not have diabetes, do not smoke have normal blood pressure and LDL (although now down to 63 with statins). I eat a healthy (Mediterranean-style) diet and, until claudication, exercised regularly (still do, but leg pain prevents me from getting a real work out). I take 81 mg asa, 75 mg Clopidogrel, 25 mg Metoprolol, 40 mg Atorvastatin, Gabapentin 600 mg. I recently found out my Lp(a) is 111 mg/dl and my hs-CRP is 6.6. What would you recommend? Please email me at [email protected]. Thank you in advance for your help! I find your blog very useful as I teach health and Human Physiology to future clinicians to always double check with the voice of experience and someone who’s actively seeing patients or has a track record of treating patients and observing the real world of results and cause and effect. I would love if you could post the references for some of the things that you say about ApoB/A ratio and exercise and lifestyle and other things on cholesterol and other themes. the worst nutritional info taught in medical schools. It appears to be fixed now. “Disqus” is no longer supported by my mature computer and its limited OS. This makes it likely that many of your more mature followers will be unable to comment. I was prepared to ask about the contentions surrounding treatment of depression on today’s blog page, but was unable. My name is India, from Caring.com. I came across your site while searching for senior living sites and communities. We would like to reach the best person on your team who manages the site or the site’s content to see if you could link to this article of ours. I have a couple of questions for you I’d prefer to discuss offline. Can you email me a contact address? Elliot here, I am working on a blog page for our company Speak-IT Solutions, based out of Worcester UK. We offer the very latest in speech-to-text solutions for industries across the board, many of whom being healthcare professionals. We work closely with organisations like the NHS to provide secure and intuitive workflow solutions like Dragon Medical (currently driving the SNOMED CT Transition). We are looking to drive relevant traffic to our blog at https://speakit.blog, as a reliable and informative resource for our clients. A lot of our material is currently aimed at the impact of speech recognition technology in the healthcare sector, we would greatly appreciate it if you could get back in touch regarding pointing your readers in our direction for some quality and informative information on various mobile dictation solutions and how they are being implemented to revolutionise healthcare documentation and receive some of the strain on various organisations. The answers and tips on Melatonin are especially useful since I’ve just started taking it! I’m with Ezoic (a Google Certified Publishing Partner) and I’d love to chat about how our platform allows you to generate incremental ad revenue and boost user experience with no risk to your website – there are no contracts. We’re not an ad network! I’m sure you get loads of emails from them… Ezoic is a layer of machine learning that lives between your ads and readers. The tech uses AI to curate the exact ad compositions (size, color, location, etc.) that resonate best with each unique visitor. Is increasing ad revenue and making your site more user-friendly something you might be interested in?